Easy and healthy Vegan Cinnamon Breakfast Muffins that everyone loves! 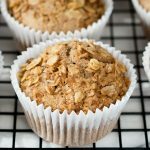 This egg free muffin recipe is made with brown sugar and lots of cinnamon for a rich flavor and moist crumb. Preheat oven to 375°F / 190°C. Line a 12-cup muffin tin with paper liners. In a small bowl, mix together the water and flaxseeds. Set aside to allow it to gel. In a separate small bowl, mix together the cinnamon crumb topping. Set aside. In a large bowl, mix together the flours, brown sugar, baking powder, baking soda, cinnamon and salt. Make a well in it, and add in the milk alternative, coconut oil, vinegar, and flax egg. Mix everything together using a fork, or a hand beater on low speed, until all the ingredients are just combined. The batter might seem a bit thick and gummy compared to non-vegan muffins that contain egg, but it's ok. Evenly divide the batter into the muffin cups. Each muffin cup will only be just over 1/2 full. Evenly top with the cinnamon crumb topping. Bake in the oven for about 16-18 minutes, until a toothpick inserted in the middle comes out clean. Allow to slightly cool in the tin, then transfer to a wire rack to finish cooling. Serve warm or room temperature. If you love cinnamon (like me!) this is a great article on the benefits of Ceylon Cinnamon vs. Cassia Cinnamon. I always and only use ceylon cinnamon (true cinnamon) because I think it taste better, and more importantly, because cassia cinnamon is more risky to the liver. Unfortunately cassia cinnamon makes up about 90% of commercial cinnamon sold. I urge you to use organic Ceylon cinnamon if you plan on consuming cinnamon regularly. We easily buy it on Amazon. For the recipe, please note this is developed using Ceylon cinnamon, which is milder and sweeter in flavor. Get this recipe for Vegan Cinnamon Breakfast Muffins at https://www.theworktop.com/breakfast-brunch-recipes/cinnamon-breakfast-muffins-vegan-healthy-easy/.